A WOMAN has called for lurchers to be muzzled after her cat was killed by a neighbour’s pet. Shirley Young’s cat, Oscar, died after allegedly being attacked by a lurcher puppy belonging to her next door neighbour. Mrs Young, from Darlington, claims her pet was fatally injured just weeks after another cat was left with serious injuries after being attacked by the same dog. She said both cats had strayed into the neighbour’s garden where they were set upon by the lurcher – a breed of dog normally used for hunting. She said: “After the first incident, the neighbour was very apologetic and said the dog wouldn’t be allowed out unaccompanied. “When we got Oscar to the vet, we found out his back had been broken as though he was thrown about and it was absolutely devastating. “We have ten cats and are careful and considerate owners – Oscar was a lovely cat, a real character. She added: “Dogs like that are hunters, it’s instinct but their owners should muzzle them as they could be nasty to other animals or even children. THE RSPCA is calling for a ban on pet primates after Bristol Dogs and Cats Home had to take in a marmoset monkey. Mickey the marmoset was picked up by inspectors after his owners could no longer cope or meet his needs. He is now in the care of Bristol Dogs and Cats Home in Albert Road, St Philips. The RSPCA says Mickey is the most recent case in a growing number of calls it’s received about pet monkeys and primates being traded as pets. Last year it saw a 73 per cent rise in the number of calls relating to primates compared to 2012. Mickey was brought to the home after the RSPCA received a call from his owner who felt she could no longer care for him. The family had got him when he was about eight months old but they were struggling to cope with caring for him correctly. RSPCA chief inspector John Atkinson said: “Like many cases we come across he wasn’t being kept in a suitable environment and was being fed inappropriate items such as leftovers from their dinner. “As a result he doesn’t know how to forage and is having to learn how to do that now. “He was being kept alone in a parrot cage and quite simply he wasn’t receiving the correct care. “When I spoke to the owner she admitted he was very much loved but was too difficult to care for. The home is now caring for the tiny monkey while a new, more permanent home is sought for him at a suitable sanctuary. While he is an unusual resident at the home, staff have asked that the public refrain from trying to visit him as he is not on public show. Now in its fifth edition, Packaged Facts’ Pet Insurance in North America is the most comprehensive examination of the U.S. and Canadian pet insurance markets available and a must-have for any company interested in this dynamic industry. Revenues (measured as gross written premiums) remained in the double digits in 2013, while showing robust growth over the previous five years, recession notwithstanding. Packaged Facts expects the North American market for pet insurance to continue to chart strong annual gains over the next five years, with the high level of competitive activity generating increased awareness and demand among pet owners. Industry pioneer Veterinary Pet Insurance (VPI) continues to lead the market. However, both the U.S. and the Canadian pet insurance markets have experienced significant market share shifts during the past five years as newer entrants have gained traction and made huge inroads into the business. The industry has been good to new entrants including Trupanion, PetPlan and PetFirst, while two smaller players—PurinaCare and PetSafe—have left the scene (with PurinaCare’s policies acquired by Pethealth). The industry has also seen some changes in ownership and financial backing, strengthening the prospects of companies including Embrace, Hartville, Trupanion and Western Financial. This latest edition of Packaged Facts’ groundbreaking 2003 report offers a road map for competing in this market both now and in the years ahead. This edition includes expanded coverage of alternative payment options and competitive forces (e.g., Banfield, Pet Assure, pet savings accounts), the impact of word of mouth and social media, more detail about the Canadian market, and meticulous discussions and examples of competitors’ marketing and go-to-market strategies. Every pet insurance player is profiled in depth, including Embrace, Fetch (Petplan), Hartville (ASPCA), Healthy Paws, PetFirst, Pethealth, PetPartners (AKC), PetPremium, Pets Best, Pets Plus Us, Protect Your Bubble, Trupanion, Western Financial (Petsecure), and VPI. Statistics provided include historical and projected market revenues, number of policies in force, and company shares (both U.S. and Canadian), along with profiles of pet owners and pet insurance purchasers, based on data from sources including Simmons and Packaged Facts own pet owner surveys. Table 2-15: Selected Internet-Related Psychographics: Dog Owners vs. Illustration 3-12: Petcard ad on Kamloops Veterinary Clinic website, captured September 15, 2013. Illustration 3-13: ChaseHealthAdvance ad from the April 2012 issue of Veterinary Practice News, just before it stopped accepting new applications and transactions. Illustration 3-14: The ChaseHealthAdvance website, just before it closed shop for good; screenshot captured August 19, 2013. Illustration 3-15: Pet Assure’s Groupon offer, July 2013. Competitor Profile: Hartville Group, Inc.
PurinaCare Acquisition a Sign of Things to Come? Illustration 4-16: Trupanion ad, captured on Pet360 website on September 13, 2013. Competitor Profile: Veterinary Pet Insurance Co.
Technicians and Technologists website, captured September 15, 2013. Illustration 4-19: Desjardins Pet Insurance Program home page. Illustration 4-20: Petsecure Vet Locator app. Pet licensing canvassing will begin in Kirkland neighborhoods at the beginning of April. Regional Animal Services of King County has hired staff to conduct door-to-door canvassing to educate Kirkland residents about licensing requirements and ensure all cats and dogs are properly licensed. Canvassing staff will visit neighborhoods near the Lake Washington Institute of Technology as well as the Juanita and Finn Hill neighborhoods.Canvassing will be held only on weekends from April through September. The canvassers will be easily recognized by a county identification badge, business cards and logo shirt and jacket. Licensing benefits include reuniting lost pets with their owners, a free ride home the first time a licensed pet gets lost and 24/7 lost pet license identification. Owners of licensed pets can participate in the Vacation Pet Alert program. License fees support shelter and care and enforcement services for responding to strays, bite investigations and nuisance and dangerous animals. Animal cruelty and neglect investigations are also supported by pet license fees. Kirkland citizens can purchase new or renew existing pet licenses online at www.kingcounty.gov/pets, or at Kirkland City Hall, QFC stores and vehicle licensing agencies. License applications can be found at city community centers, pet stores, local veterinarian offices and libraries. King County code, as adopted by reference in the Kirkland Municipal Code, requires all cats and dogs eight weeks and older are to be licensed, whether they are indoor or outdoor pets. Kirkland’s Animal Services Program is supported through an Interlocal Agreement between the city of Kirkland and animal services. The Kirkland Police Department oversees the contract. As part of its pet license program, the police department conducts a monthly renewal reminder to licensed pet owners using an automated calling system. For specific questions about the canvassing program, contact Canvassing Coordinator Sandy Jones at 206-205-6167. Funny Fur, a Houston dog boutique and pet supplies store, is offering customers a discount on all pet identification tags in honor of National Pet ID Week, April 13-19, 2014. National Pet ID Week was started in an effort to improve the return rate of lost pets and reduce the number of pets taken to shelters. According to the National Council on Pet Population Study and Policy (NCPPSP), of lost pets, less than 2 percent of cats and only 15 to 20 percent of dogs are returned to their owners. Most of the pets that were returned to their owners were identified with id tags, tattoos or microchips. Using more than one identifier is the safest insurance against losing a dog or cat. A pet ID tag, registration tag or rabies tag along with an implanted microchip will ensure that if the collar with the tag is lost, any shelter, rescue group or veterinarian will be able to locate the owners. While microchips are a permanent and reliable resource, they are invisible without a microchip reading scanner. Visible pet ID tags are the first line of defense and the fastest method of getting lost pets safely reunited with their owners. 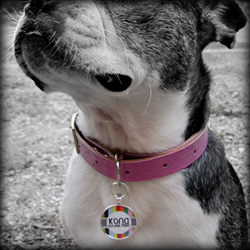 Pet ID tags are available in an array of sizes, colors and styles. Funny Fur offers plastic, metal, 14 karat gold and sterling silver tags that are plain or decorated with colored enamel, Swarovski crystals or printed designs. As an alternative to tags, Funny Fur also offers personalized pet collars with contact information engraved on metal buckles or embroidered on the fabric part of the collar. Funny Fur is offering 10% off all pet ID tags during National Pet ID Week to encourage all owners to place a tag on their dog or cat. Please visit Funny Fur’s website (http://www.funnyfur.com), store Facebook page, or subscribe to their store newsletter for a full schedule of upcoming events. Funny Fur is a premier pet supply store and boutique specializing in designer dog clothes, dog carriers, and other pet accessories for pet parents. Funny Fur also offers a great selection of all natural and holistic pet foods and treats, raw pet food, and all natural solutions for general household and pet care products. Funny Fur contributes to local animal rescues and other non-profit organizations dedicated to the wellness of animals.